Step 1: Make a video of the audition requirements. The audition video should NOT be edited, but it is okay for each selection to be recorded separately, and uploaded as one or several videos. Step 2: Post the video on YouTube by February 18, 2016. Decisions will be made and applicants notified by February 28 2016. 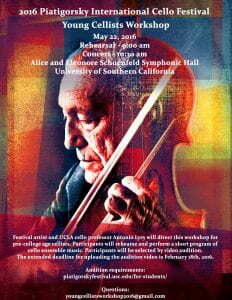 Please direct any questions to youngcellistsworkshop2016@gmail.com. 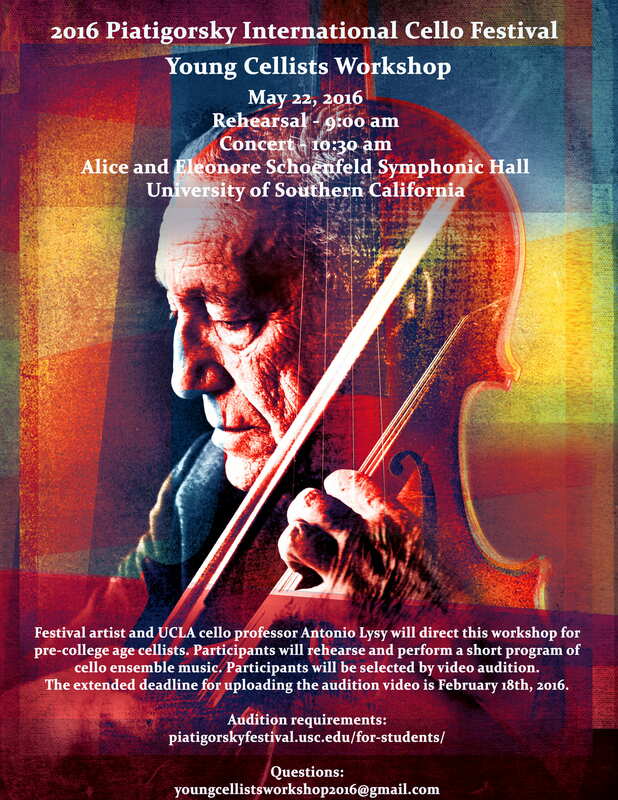 A select number of those chosen for the Young Cellists Workshop may be invited to participate in the mass cello ensemble performance at Walt Disney Concert Hall on Tuesday, May 17, 2016 at 8:00pm. Mass cello ensemble participants are required to attend rehearsals on Sunday, May 15 from 10:00am-noon; Monday, May 16 from 10:00am-noon; and Tuesday, May 17 from 5:30-6:30pm. Due to the limited rehearsal time, participants should be at an advanced level.